I know it’s hard to believe but many years ago I was moderately successful and pretty much destined to be the next D.G. Or at least the next big Yentob. And when you’re climbing up that greasy pole you will be forced into awkward situations such as the ‘business lunch.’ This post is about how not to have a business lunch. Or maybe it’s about how to have a business lunch. Either way, the first time you have something like this can be a bit stressful. So my Exec at Tiger Aspect asked me to Series Produce the third series of Bailiffs, which was exciting and a bit daunting for a comparative whippersnapper. I bought a new suit and everything. On reflection I don’t think it was a great fit and I looked a bit of a bell end in it. In fact I know that because I tried it on some years later in front of my sartorially honest girlfriend who looked me up and down and laughed. But at least I made an effort, right? To freshen up the show we were trying to secure access to film the work of court enforcement officers and county court bailiffs. So we were wooing the Court Service and this resulted in a lunch with the then head of said service. We’re talking high up, big cheese, civil servant. A massive mandarin. And mandarins are usually really small, so that made it a big deal. The venue chosen by my Exec at Tiger Aspect was The Cinnamon Club, a very posh curry house. Now, the thing about cuisine from the Indian sub-continent is that it can be a little on the peppy side. And I am one of those people who cannot deal with spicy food. I love it, but sometimes a dish that to other people seems fairly mild will blow my head off leaving me as sopping wet as a mop before it’s squeegeed or Tom Daley at the Olympics but with the grace of the first celebrity to get booted off his ITV show Splash. The starters went fine and there was some idle chat about food and I seem to remember my exec and this very senior civil servant swapping dinner party recipes while I sat there very occasionally chipping in with an ‘ooh, yes that sounds lovely,’ and ‘Yes, I’ll definitely make a beef wellington when all my intellectual friends come round for dinner to talk about art etc.’ But then the main courses arrived and we were into the spicy meat of the matter, although I seem to remember I had fish. And it was the hottest fish I have ever come across. And I don’t mean I wanted to take it home and play Barry White to it. I mean that it blew my head off in a spectacular fashion. So, while we were trying to convince this knight of the realm (for he was a Sir) to allow us to point our cameras at his courtly employees I sat there sweating like the guiltiest man in the world. Guiltier than a man caught red handed in a bang to rights open and shut case. I had to excuse myself to freshen up and use the hand dryers in the loos to dry my matted locks. It was that bad. My exec was looking at me strangely as if to say, ‘Why did you order the super spicy hot fish?’ But I didn’t really have a clue what I was ordering, this wasn’t the Purple Mango down the road where I am familiar with the menu and can seek advice without fear of looking like an uncultured idiot. As it happens I’m not sure there’s any great lesson in this tale. Sir Mandarin was positive towards our proposal and agreed that it could be useful for people to see the workings of the court officials and we were able to gain access to film. In spite of my low tolerance of spicy food, I had made two series of the show already, so was able to fill him in on the way we worked while mopping my brow, slurping huge quantities of water and constantly pushing my spectacles from the tip back to the bridge of my nose where they belong. I guess the difference now would be that I would be open about the fact that I am a soft arse when it comes to spice and not be so tense about the whole situation. As a more mature person I am more relaxed in my sensitive skin. 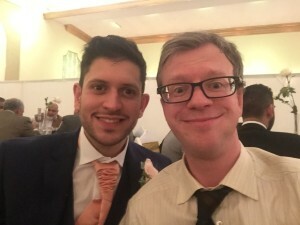 For example, I was at my friend Abdullah Afzal’s wedding in Manchester the other night and knew that there was a high possibility that, as one of only two white guests, I would be the sweatiest guest as soon as a morsel of food touched my lips. So I prepared the table of people I had mostly never met before for the situation. And we all had a good laugh about it when my head exploded seconds after the impact of spice on tongue.